Kashmir. No one makes a noise. sewage and drinking water pipes. No one objects. 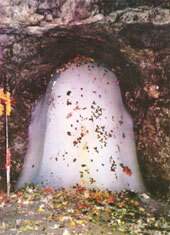 Yatra pilgrims, all hell breaks loose. by removing every symbol of Hinduism and other faiths from the valley. have paralysed the life in that part of the state as well. build the 89 km-long Mughal road. who instigate people to come out on the streets? who changed the demographics of the valley. Hindus were slaughtered and the valley's demographics were altered. Muslims implying that Hindus are not welcome in the valley anymore? from the state of Jammu & Kashmir itself. transfer of land is illegal. transferred to the chairman or the CEO of the board per se. minister during the second three-year part of the six-year term. to garner votes in the upcoming assembly election, it backtracked. by fooling the local Kashmiri Muslims. And that leaves the Congress. Shri Amarnath Shrine Board. Now that is some level of appeasement! That is the real story behind the story. lakhs of Hindus from all over the country. politicians believe in appeasing Muslims at the cost of Hindus. the pilgrimage has been going on for many years. change and improve the facilities? to promote the status quo! and forced people to come out on the streets. fundamentalist forces and then at the same time claim innocence. and thus need to be held accountable. day result in the nation's doom. democracy and fairness to one and all.